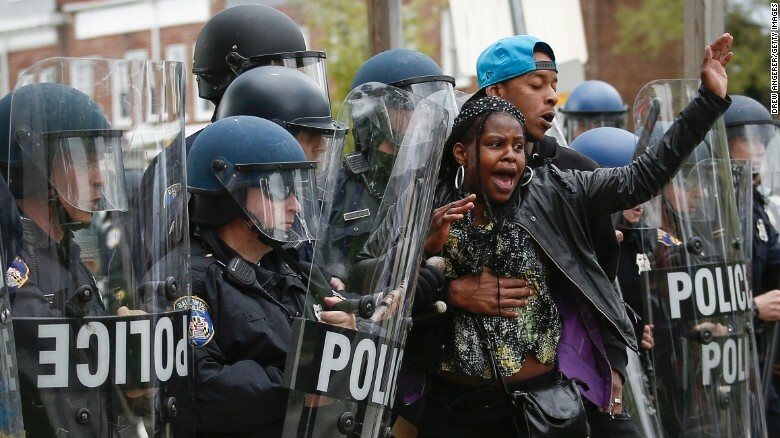 Yesterday, Baltimore epitomized a divided America. On Monday, we saw a tale of two cities evoking the worst and the best of times. Yet, everyday citizens within their besieged communities risked danger to combat the unfolding evil. Some members of the community acted as human shields to protect the police from the mob, while many marched in unity to qualm fears and elicit peace. One mother publicly berated her son who had joined the rioters. Many politicians and pundits have conflated the tragic death of Freddie Gray while in police custody with the death of Michael Brown in Ferguson, using the false narrative of endemic white racism as a starting point for discussion. The racial grievance industry has a vested interest in perpetuating racial hoaxes for fun and profit. As we await the conclusions of the various investigations into Gray’s death, let us remember that every investigation into Brown’s death absolved the police. We don’t know, yet, exactly how Gray died, but we should know soon. When we do know, we can take appropriate action. Another difference: the Brown family called for Ferguson to be burned, while the Gray family petitions for peace. The racial grievance industry continually promotes its propaganda which, most often, finds fertile ground in the inner cities. As a direct consequence of their false racial narratives, many turn to violence, as we saw in riots stretching from Ferguson to, now, Baltimore. Apparently the residents of Baltimore have a long history of tension with the police. But, more crucially, there is a generational, not just racial, divide in that city. Teenagers, raised in the petri dish of the welfare state and multiculturalism, have been indoctrinated into believing that America owes them for slavery, which has been abolished for more than one-and-half centuries. Taught that they are victims, they feel entitled to redress. For them, the welfare state is just the beginning. Baltimore, like so many urban communities, is beset by competing worldviews, ambitions, and goals. Some are firmly fixed in that distant past of racial grievances and the so-called legacy of slavery. They have adopted a victim mentality and inculcated a sense of entitlement. A feeling that America owes them. Democrat-controlled cities, failed liberal polices, dysfunctional families and subculture – these are the root causes of the violence we have seen erupt in cities across America. As a direct result of these policies, the black nuclear family has been decimated and black criminality is entrenched in many communities. In contrast, others are rooted in a more traditional past, filled with faith and values, optimistic for the future, embracing freedom and personal responsibility. For them, doing the right thing is always the right thing to do, even when it hurts. They value the goodness and greatness of America. Then there are the anarchists and professional activists who simply seek to destroy or to profit from that destruction. 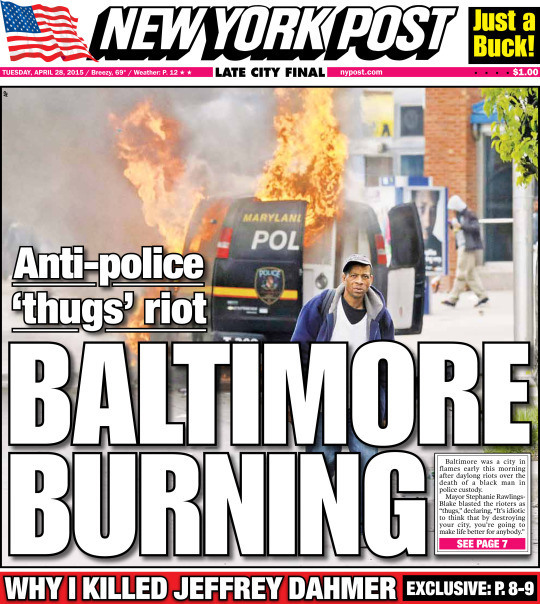 Baltimore – despite ample warning – was unprepared for the riots. Charles Krauthammer called it “a total failure of leadership” at the local and state levels. She wanted to balance free speech rights and anarchy? It was, as one commentator observed, a “complete capitulation” to the rioters and anarchists. Later, Mayor Rawlings-Blake spoke the obvious: “It’s idiotic to think that by destroying your city, you’re going to make life better for anybody.” But “making life better” isn’t the purpose of riots. Anarchy and destruction are its own rewards. But how can you solve the problem when you can’t even identify it? It was jarring to hear rioters referred to as “protestors,” even on Fox News. The old Leftist argument that one person’s terrorist is another person’s patriot continues to fly in the face of reality and moral truth. Although the Sixties’ counterculturalists and their ideological progeny deny the existence of absolute truth and moral absolutes, their denial fails to change the reality in which we all live. Haven’t we learned anything from Obama? The President cannot even call Islamic terrorism what it is – terrorism motivated by Islam. That popular slogan, in fact, is flawed and often used to incite violence. The words and actions of people on the ground, politicians, pundits, the clergy, and ordinary citizens inspire hope and confidence. Let’s be adults. Let’s “purge” immaturity from our lives and our communities. See “I’m Black: Truth Does Not Matter” at http://wp.me/p4scHf-5t. See “Ann Coulter Takes on the Racial Grievance Industry” at http://t.co/YgG2rpgZIc. See “Ferguson: Justice, Race, and Reason” at http://t.co/ksowFPCx62. 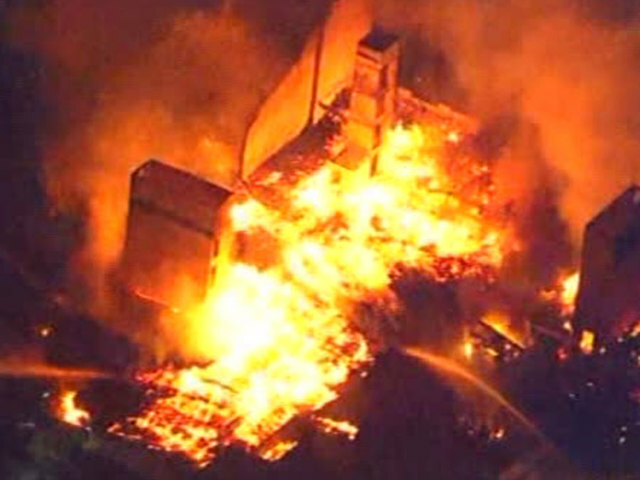 See “Ferguson in Flames” at http://wp.me/p4scHf-5I. See “Identity Politics Is the Problem” at http://wp.me/p4scHf-1l. See “Obama’s America – Fundamentally Flawed” at http://wp.me/p4scHf-1h. See “American Exceptionalism is in the Eye of the Beholder” at http://t.co/UDFIbFm5hr. See “Is Baghdad Burning? Obama’s Leadership Vacuum” at http://t.co/anrh8hfqtC. See “CVE: How to Submit to Jihad” at http://wp.me/p4scHf-7x. This ultimately leads to Obama’s ludicrous proposition that poverty, not religious fanaticism, is the real reason jihadists behead infidels. See “Root of Evil: Let’s Put ISIS on Welfare” at http://wp.me/p4scHf-7s. See “Propaganda Kills” at http://wp.me/p4scHf-6n. 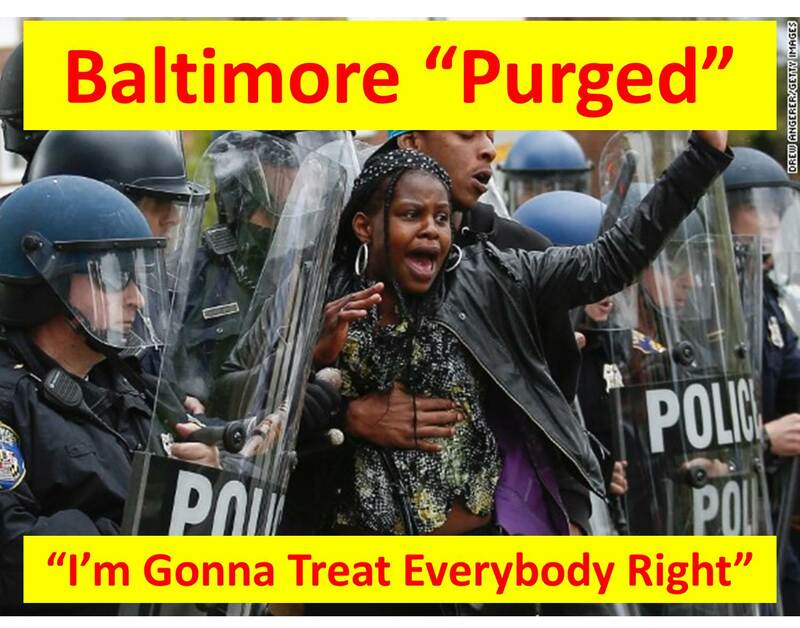 This entry was posted in Uncategorized and tagged Baltimore riots, entitlement, Ferguson, liberalism, police, propaganda, race hoaxes, racism, victimhood, welfare state on April 28, 2015 by BrotherWatch. They are screaming and yelling that he was not buckled up in the ambulance. Question how many millions of kid rid in yellow school buses without seat belts. How about all of them! Poor Freddie. He was such a role model for unlicensed pharmacists everywhere. Try to rest in peace Freddie even though it’s very hot down there. While I cannot comment on his spiritual state or final resting place, it is amazing how the Left tends to characterize criminals and thugs as heroes and patriots. As for his cause of death, we will have to await the investigation and see the evidence to determine what really happened. The real Gang in Baltimore is the Baltimore City Officials and the Mayor and the State’s Attorney are the Bigg Boss of the Baltimore Gangster. Freddie Gray is one of their Brothers who died while “on duty” to keep their street like what is showed in “The Wire” despite the 20 arresting records in the criminal justice system and 5 ongoing trials. In Baltimore City, professional criminals, legal system and the public officials are the only ones who make money. Poor Baltimore Tax Payers! The innocent people can only be the victim of the crime and the scapegoat for the criminals. The career criminals started being arrested since age 17, is set as the role model and the murals are everywhere in Baltimore. The Mayor and the State’s Attorney represent the best of interest of Criminals to the best. People knows the best way to live in Baltimore is to send their kids to schools with no AC and the schools have to put them on vacation so they can practice their criminal skills and think a way to blame on the police. Can somebody fire the Mayor and the State’s Attorney?